Octave Octa is a digital octave stomp box for both guitarists and bassists. Two octave voices blend with dry level control and support polyphonic processing in the default mode, so playing a chord is absolutely no problem. And there is an additional DIRTY mode which simulates the classic analog octave pedals (single note processing and a different tone). 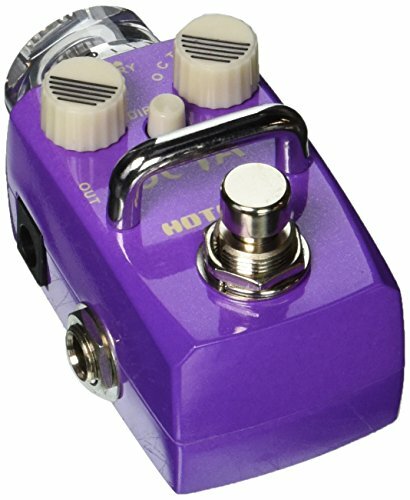 The Hot one Skyline Octa stomp box is set to perform in any venue for every genre. DIRTY mode shines in the hands of shredders making face-melting solo runs: its thick and dimensional, giving you a sense of being surrounded. POLY(default) mode finds a place across the spectrum of playing styles. When you get the high and low octaves going, you can have the smooth and warm body of an organ. With both DIRTY and POLY octave modes available, this stomp box is ready to satisfy the octave needs of basically every guitarist out there. True Bypass Footswitch Zinc Alloy Outer Cover Transparent top knob and 2 noctilucent small knobs Cool LED lights Current Consumption: 53mA Dimensions: 74mm (D) x 44mm (W) x 44mm (H) Weight: 190 g.